A ceremony took place in Custume Barracks last Saturday (September 17 ) to honour the actions of the men of ‘A’ Company, 35th Infantry Battalion and its attachments at the Battle of Jadotville. Jadotville was an event that occurred during Ireland’s peacekeeping mission in the Congo in September, 1961. ‘A’ Company of the 35th Infantry Battalion took responsibility for the UN post at Jadotville on September 3. On the morning of September 13, the Company came under attack from a large force supporting the breakaway province of Katanga. Despite their courageous resistance and the sustained efforts of 35 Infantry Battalion HQ to provide assistance, ‘A’ Company was taken into captivity on September 17, and remained there until released in late October. On the 55th anniversary of the siege last Saturday, Minister with Responsibility for Defence, Deputy Paul Kehoe, presented a Unit Citation to the Company in recognition of their bravery. A copy of the Citation was presented to each member or next-of-kin of the unit. Minister Kehoe has also commissioned an insignia recognising the professional performance of ‘A’ company. “I am very pleased to present this Unit Citation which recognises the bravery and courage of ‘A’ Company during the Siege of Jadotville whilst cut off from support and reinforcements,” Minister Kehoe said. “The United Nations Operation in Congo was the first peacekeeping mission in which significant numbers of Irish soldiers took part. A total of 6,000 Irish soldiers served in the Congo from 1960 until 1964 and I want to take the opportunity to recall the contribution of all who served in the various Irish contingents over the course of this long mission. 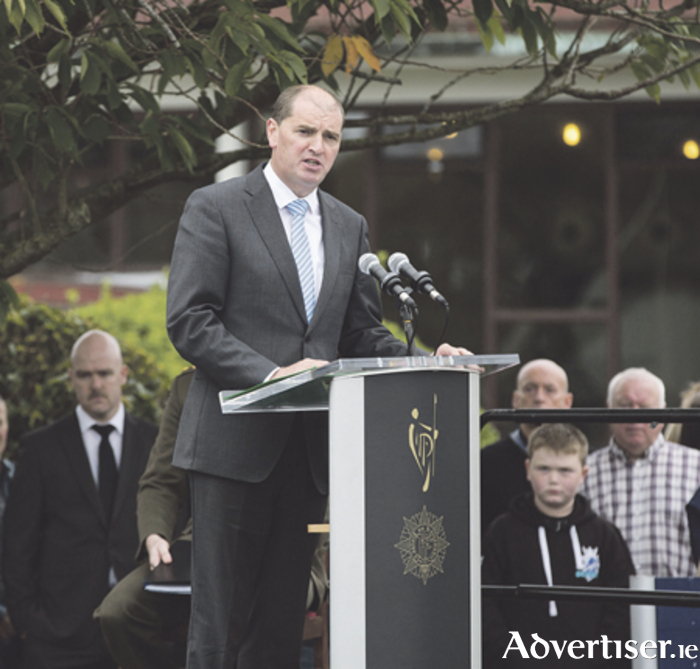 Longford-Westmeath Independent Deputy, Kevin ‘Boxer’ Moran, said the ceremony rights a “grievous wrong” ignored by successive governments. He said he hopes the recognition of the heroism of the ‘A’ Company will finally bring some comfort to the wives, children, and grandchildren of the deceased soldiers of ‘A’ Company, and to the remaining 60 veterans who have been “waiting for the right thing to be done by them after 55 years”.